Our Mexican Flower Bouquet sham is a sophisticated, bold explosion of flowers in a range of blues, greens and creamy white. 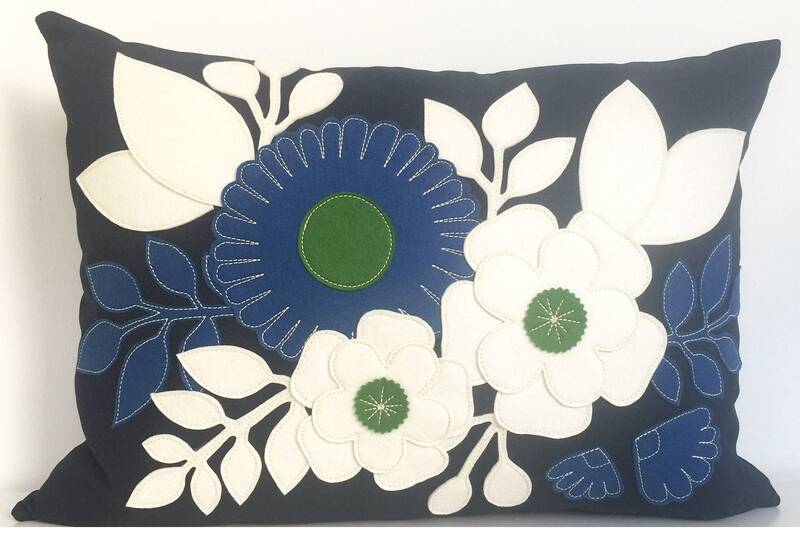 The design is inspired by Mexican embroidery, using 100% wool felt applique flowers on a gorgeous heavy cotton in deep navy blue twill. This incredibly unique pillow is a treasure to behold--beautiful in a bedroom, nursery or living room! Available in three colorways and custom colors are available on request. All of our pillows are made with love in our studios in Belmont, MA, where we design and sew all of our products. We hand cut our appliqués, hand embroider details, and machine stitch to ensure durability. Cheeky Monkey products are made beautiful and strong for all to enjoy. Many of Cheeky Monkey Home's pillows are made to order. Please allow 3-4 weeks to ship. Please visit our Policies Page, to learn more about shipping, payment and returns. AWESOME, Just Perfect, Thank you again so Very Much!! !